The Riverside State Trooper barracks. Members of the Bay View Pines Civic Association will be hosting the commander of the New York State Trooper barracks on Route 104 to their next meeting on Nov. 6 to discuss the state’s decision to cut staffing and dispatching from that barracks. Civic Association President Ron Fisher has also invited state representatives to the meeting. On Oct. 22, State Senator Ken LaValle and Assemblyman Fred Thiele asked Governor Andrew Cuomo’s office to rethink the staffing change and also to hold another class to qualify State Troopers. They also said they intend to ensure there is funding in the state’s 2016-17 budget for training new recruits. 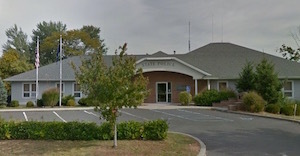 Mr. Thiele and Mr. LaValle said they were disappointed to learn that the front desk will be unmanned, the doors will be locked, dispatch will be handled off site, and at certain times there will be no troopers in the building to unlock the doors in an emergency situation, mostly due to a shortage of State Troopers in the region. The Bay View Pines meeting will be held at the David W. Crohan Community Center on Flanders Road. Just a reminder that tonight, November 6 at the Crohan Center in Flanders…both Lavalle and Thiele will be at the Bayview Pines Civic meeting discussing the Trooper Barracks at 7 p.m. Hope to see you all there!